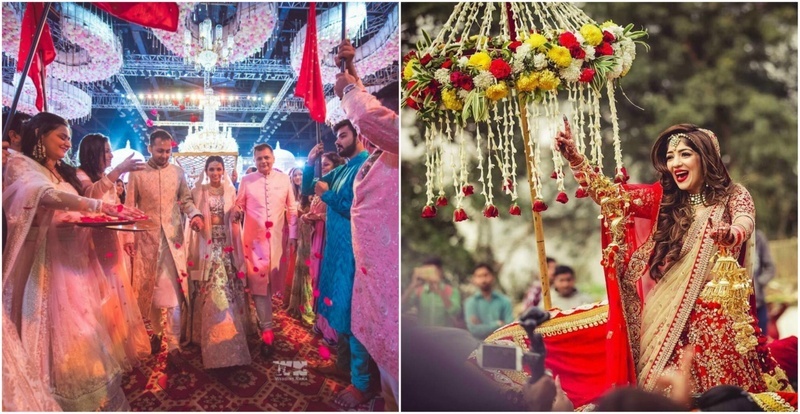 6 Unique Bridal Entries That Will Make Heads Turn At Your Wedding! With the bride's entry being one of the most sought-after parts of a wedding, it’s only natural for brides to get more and more creative with it with the years passing by. If you are also searching for a uber cool way to enter at your wedding, you are at the right place. This is us listing 6 unique bridal entries you just cannot miss if you are planning to turn heads at your wedding. Always wanted to enter your mandap under a ‘phoolon ki chadar’ (or the bed of bells in this case) with your brothers by your side? Then this bridal entry is totally you! Although be prepared to witness a moment of extreme happiness with a tinge of pain at the same time. If a fairy-tale bridal entry is your thing, then you have got to check this one out. It’s a surreal and beautiful entry of the bride on a boat. You will also get a glimpse of her magnificent 30-feet long veil carried by her cousins. This bride opted to dance on ‘Ladki beautiful kar gayi chul’ for her bridal entry. What we love about this bride is the way she’s a little shy but still gets all the moves right at the same time. If a grand entry to your wedding is what you are looking for, then you’ll definitely like this ‘queen-like’ bridal entry! Here, we see the bride entering the mandap on a moving chariot with ‘Afreen Afreen’ playing in the background. Make way for a bride with SWAG! This bride shows us, that if you can’t ride the Royal Enfield yourself, you can always have your sibling or one of your bridesmaid ride it for you! Yes, that’s an option too! If your wedding venue has an inbuilt helipad, this definitely will be a bridal entry that will turn more than just the heads at your wedding! So, which one would you pick for your grand entry towards the mandap?